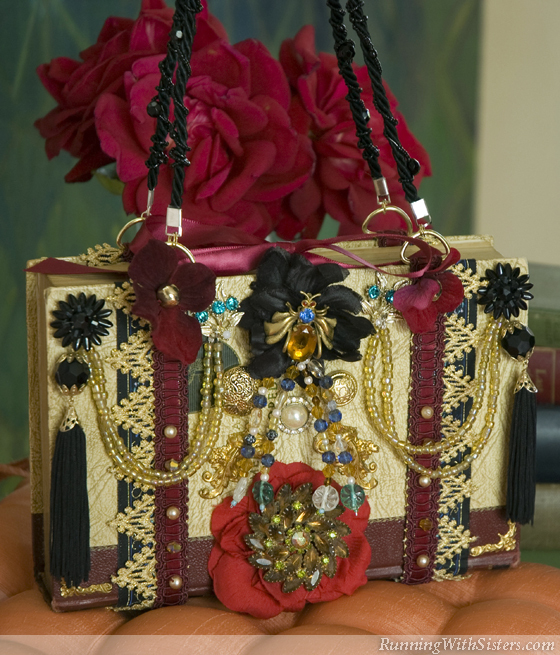 Turn an old book into a glamorous evening bag with irresistible flea market beads and brooches. We love going to the flea market for vintage beads and materials. We’re always on the hunt for old time treasures to inspire new projects. So when we found a basket of silk flowers next to a bowl of broken jewelry, we thought they would look beautiful on an evening bag. As crafters, we wanted to do more than just pin them on a purse, so we decided to use an old book as the bag itself. We hollowed it out, embellished it to the nines, then finished it off with a beaded rope handle. Now that’s a smart pocketbook! 1. To embellish the ribbon straps that go around the book, cut the gimp trim into two equal pieces. 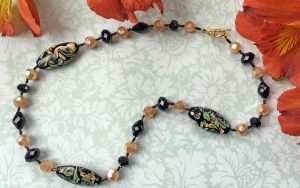 Using the sewing needle and thread, sew five flea market beads onto the gimp trim starting 4 inches from the end. Sew the beads along the gimp for 3½ inches, leaving about ½ inch between each bead. Repeat for the second piece of gimp trim. 2. To create the ribbon straps that go around the book, cut the embroidered ribbon into two equal pieces. Using the Amazing Goop, glue the ribbon around the cover of the book 1 inch from the top. Tuck the ends inside the front cover and back cover of the book. Cut the gold triangle lace trim into two equal pieces and glue on top of the embroidered ribbon, tucking the ends inside the cover. Lay the gimp trim on top of the gold trim and embroidered ribbon so the sewn-on beads are on the front of the book. Glue into place, leaving 1 inch on each end unglued. Feed a D-ring onto each end of the gimp trim, then tuck the ends inside the book cover and glue them down. Secure by stapling the ends of the ribbons to the inside cover of the book. Repeat to create a second strap 1 inch from the bottom of the book. 3. To make the purse closure, cut the burgundy ribbon into two equal pieces. Glue the end of one piece to the inside of the front cover in between the ribbon straps. Glue the end of the other piece to the inside of the back cover. Let dry. 4. Open the front cover of the book. Press all the book pages together tightly and paint the outside edge of the page stack with the varnish. Let dry. On the first page, draw a rectangle 1 inch from the edge as a guide to hollow out the book. Use the X-Acto knife and the ruler to carefully cut through the first few pages of the book along the guidelines. Remove those pages. Repeat cutting deeper and removing a few pages at a time until you almost reach the back of the book. Varnish the inside edges of the hollowed out space. Let dry. 5. 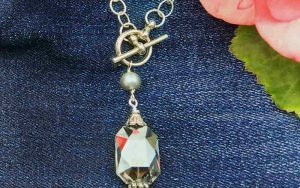 To make the four beaded dangles to hang from the medium brooch, gather together a selection of flea market beads. Cut a 5-inch length of 26-gauge wire. Bend one end over 1/16 inch and flatten with chain-nose pliers. Feed a seed bead and then a large pretty bead onto the wire, followed by a random selection of vintage beads until you have covered 3 inches of the wire with beads. Repeat to create a total of four dangles. Twist the four unbeaded ends together, then shape into a wrapped loop. Trim the ends. Slide the wrapped loop onto the pin back of the brooch, then pin the brooch onto the center of the medium silk flower. Turn the book on its spine and glue the flower to the top edge of the book cover, between the ribbon straps. 6. Pin the large rhinestone brooch to the large silk flower. Glue the silk flower to the bottom edge of the book cover. 7. Use the wire cutters to snip the shanks off the backs of three vintage buttons. Glue the buttons in a half circle beneath the flower with the bug brooch. Glue the two flourish appliqués above the large flower and brooch. Glue the corner appliqués to the lower right and left corners of the cover of the book. 8. 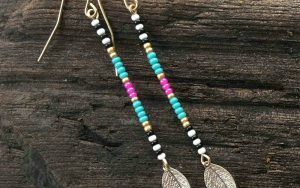 To make the beaded swags, remove the paddle clips from the backs of the clip-on earrings. 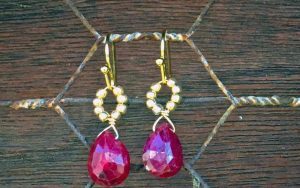 Feed a 7-inch length of beading wire through the back of one of the earrings and secure tightly with a crimp bead. Feed 6 inches of light topaz beads onto the wire. Feed the end of the wire through a different clip-on earring and secure with a crimp bead. Then make an 8-inch version going through the same holes. Repeat using the other two earrings. Place the beaded swag at the top edge of the book, so one earring is in the corner and the other is next to the bug brooch and flower. Remove the tassel from one of the tassel earrings and attach it to the clip-on earring in the corner with a 3mm jump ring. Glue the clip-on earrings to the book. Repeat to add a tassel to the second swag and glue it into place to mirror the first swag. 9. Remove two large gold beads from the broken necklace. 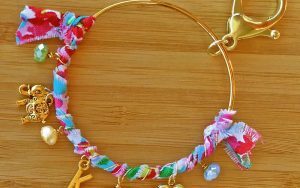 Sew one bead into the center of each small silk flower and glue to the top edge of each ribbon strap, below the D-rings. 10. To line the inside of the purse, cut the velveteen paper to fit the opening. To do this, mark the velveteen scrapbook paper with the width and length of the hollowed out opening, then add the depth of the opening to all four sides. Cut out the velveteen lining. Fold the edges of the lining in to fit inside the hollowed out space. Unfold the lining and cut away the corners along the fold lines. Cover the back of the lining with the Goop and press into the hollowed out space. Trim with the X-Acto knife, if necessary. Cut a piece of brown and gold swirl paper to fit the inside cover of the book and glue into place, gluing over the ends of the ribbons and trims. 11. To make the beaded handles, cut the black satin rope into two equal pieces. Place an end connector on each end and press closed with the chain-nose pliers. Cut a 36-inch piece of 26-gauge wire. Bend one end over 1/16 inch and flatten with chain-nose pliers. Slide 2 inches of black seed beads onto the wire, followed by a black faceted round bead from the broken necklace. Add 2 more inches of seed beads, then a black bead from the broken necklace. Repeat the pattern leaving 3 inches unbeaded at the end. Make a temporary loop in the end of the wire to keep the beads from sliding off. Wrap the other end of the beaded wire to the rope, starting ½ inch from the crimp. Wrap the beaded wire around the rope until you reach the other end. Trim the excess wire, bend the end over 1/16 inch and flatten with chain-nose pliers. Fasten each end of the beaded wire by wrapping it around the rope then onto itself. Repeat to embellish the other rope handle. Attach the handles to the D-rings with split jump rings. 12. Fill your evening bag with a lipstick and opera glasses, then tie it closed with the burgundy ribbon, finishing it off with a bow. Bargain Hunt: Once you’ve found your book, beads, and brooches, keep your eye out for the rest of your supplies. You might be able to find the rope, ribbons, and trims at the flea market too. What a savings! Book Smarts: When picking out a book for this project, look for one with a pretty cover or an interesting spine. But before you buy it, feel how heavy it is. Some old books weigh a ton and that would be no fun on your shoulder.